LOL!! This is to cute. Exactly the reason we stopped putting up a tree years ago. That and we had a wire chewer. Wasn't worth the risk. Ooh this so made me smile! Fabulous card! Oh, this is hysterical! Love that jailed kitty image. PAWsome card. Haha...this image is hilariously fun! Of course, anyone with a cat can relate to it completely! Oh my goodness! What cat lover wouldn't love that image? I love the way you left the cat uncoloured except for the sign which he is holding. It really pulls attention to him. I can't help but keep going back to chuckle at that cat. Great idea! Thanks so much for joining our Watercooler Wednesday Challenge this week. That mug shot is HYSTERICAL!! We DEFINITELY need to get Technique Junkies as a sponsor next year -- Janis -- hint hint! After I picked myself off the floor from laughing I had to see who makes that awesome cat stamp. 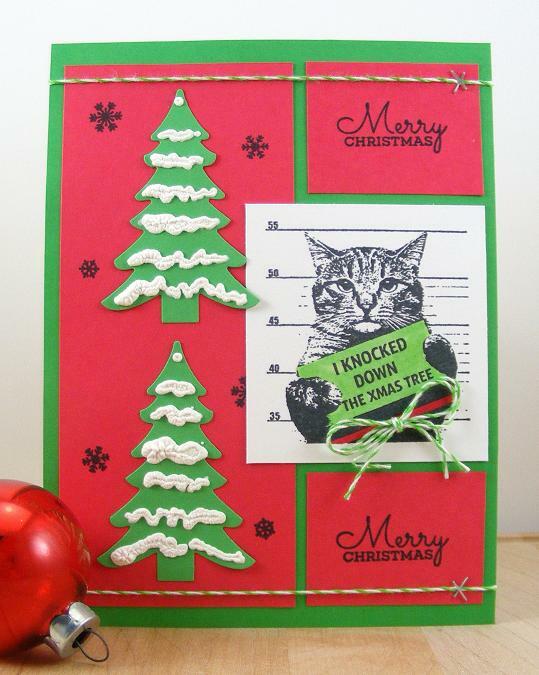 This would make such a great Christmas card to send to all my cat loving friends and family. OMGoodness, this is hilarious! LOVE that cool stamp! Must check out Technique Junkie - I am not familiar with this company! LOVE your card! LOVE that stamp! Adorable card! OMgoodness what a laugh I had when I checked out your card. The cat in the police lineup looks uber guilty. Love how you've coloured everything but he culprit in question. Great card! Bev thanks so much for playing along with week at the Watercooler Wednesday Challenge! Mugshot kitty - haha!! Brilliant stamp and a wonderful card! 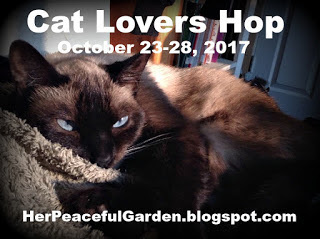 I liked having National Cat Day (Oct.29) as the extra day for commenting after the link up closed. So I think we will do it that same way next year: Oct. 23-28, 2018. It won't fall neatly into a week like it did this year...more like a Tues thru Sunday, but we will finish up with the bonus post on Mon, Oct. 29th. Thank you for offering to contact her to be a sponsor!! Bwahahahaha.....LOVE that stamp...so funny!!! That was my Skippyjon last year. We set the tree up in my craft room so the door could be closed. He still sneaked in there when I was elsewhere and knocked the tree over...more than once!! lol... This card is fabulous!! Thank you so much for joining in the #CatLoversHop2017!